Austerity in England has eroded planning’s ability to serve the public interest, according to planners who took part in a study by the Royal Town Planning Institute (RTPI) and Newcastle University. 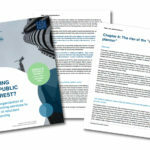 Under-resourcing, coupled with reforms that have undermined planning’s strategic role, have relegated it to a largely reactive, regulatory function in many local authorities, creating a ‘box-ticking culture that has closed off the space many planners traditionally used for reflection, professional discretion and proactive planning’, according to the report. Respondents said many local planning authorities (LPA) have adapted to resource pressures by being more efficient and business-like, but raised concern that planning is increasingly seen as a commercial, revenue-generating tool which could skew decision-making on applications. ‘Serving the public interest? The reorganisation of planning services in an era of reluctant outsourcing’ is an in-depth qualitative study based on focus groups held in Belfast, Bristol, Cardiff, Edinburgh, Leeds, Leicester, Greater London and the South East with around 50 planning professionals. Victoria Hills, RTPI Chief Executive, said: “Local planning authorities have demonstrated exceptional resilience in the face of austerity by becoming more streamlined and efficient. Whilst planners in Wales, Scotland, and Northern Ireland remain overall confident, planning in England does face some serious challenges. The study highlights the ‘austerity planner’, an emerging type of public sector planner whose career has been defined by austerity and post-2010 planning reforms in England. ‘Austerity planners’ are in high demand and are often highly skilled, but they often have ‘little room for proactive planning or independently executing their professional judgement’, which can erode job satisfaction and critical reflection, the study finds. They are also found to move jobs rapidly, often at the expense of building long-term relationships with customers, places and colleagues. Sound, experienced leadership has also suffered under austerity, with many consultancies offering a well-paid alternative to the public sector.